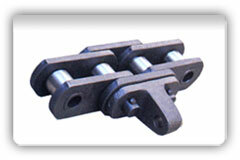 Tripcon manufactures Bushed Chains with a variety of loads as per suitability to the applications. Tripcon manufactures Bushed Chains in Carbon Steel, Alloy Steel as well as Stainless Steels. Tripcon manufactures Bushed Chains with variety of Steel grades which after heat treatment gives low coefficient of friction, high strength, durability and optimum output to the equipment. With this base Bushed Chains Tripcon offers a variety of welded and integral attachments to facilitate appropriate conveying applications. Plot No. : 1115, Phase - IV, GIDC, Vithal Udyognagar - 388 121, Dist. : Anand, Gujarat, India.